Having dogs has many perks, however, a lush, green lawn is not usually one of them. 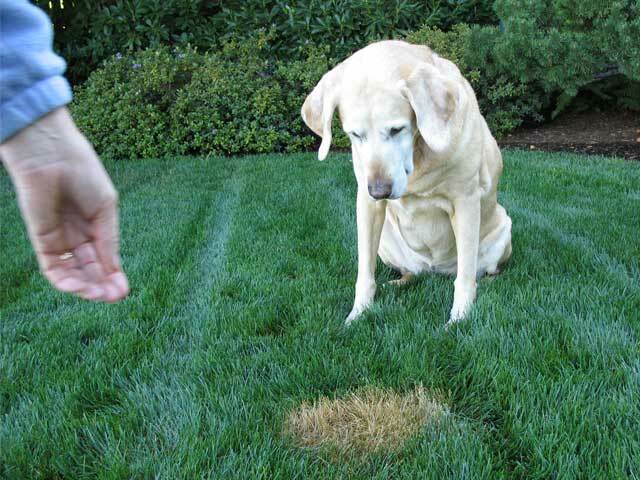 Unsightly brown spots in the lawn can appear after a dog relieves its bladder. What causes dog brown spots? These spots are caused by high levels of Nitrogen and not “acid” in dog urine as is commonly believed. Excess nitrogen in the waste is normal and due to proteins being broken down during digestion. Dog diets are usually high in protein so there will be high levels of Nitrogen. Small amounts of Nitrogen are good, but too much will kill patches of lawn. According to the American Pet Products Association, 62% of US households have a dog. That equates to a lot of brown spots being formed on lawns across the country! What can be done about dog spots in the grass? Watering the spot immediately after the dog has done its business will help dilute the Nitrogen. Running the hose for 10 seconds over the spot will help lessen the probability of the Nitrogen killing the lawn. Also, encouraging dogs to drink more water will internally dilute the Nitrogen. However, this technique will cause more trips outside. Running the hose for 10 seconds over the spot will help lessen the probability of the Nitrogen killing the lawn. Also, encouraging dogs to drink more water will internally dilute the Nitrogen. However, this technique can also cause more trips outside. Construct a non-grassy designated area. For example, a pine straw, mulched, or leafy area in the yard makes it pee-proof. Training the dog to use that area to potty may take a little time, but it is totally possible. Leading the dog to that area when it’s time to go will create a habit and a little positive reinforcement will encourage the dog to use the designated area. A homeowner can make these areas visually appealing to humans by placing potted hostas, ferns, or other greenery around the area. Having the right kind of grass may also contribute to how easily and frequently these brown spots show up. Fescue and Ryegrass are the most resistant to Nitrogen due to the genetic makeup of the roots. Bermuda and Kentucky bluegrass do need nitrogen to thrive but are very sensitive to the time of year that they get fertilized. Unless the dog is only allowed to go outside during the spring and summer, these types of grass are very sensitive to Nitrogen and susceptible to brown spots. If the lawn is suffering from brown spots, try reducing your fertilizer input. Even small amounts of fertilizer may contain enough Nitrogen to kill the lawn in combination with the dog’s contribution. If you think your lawn needs a boost, try using a soil enhancer or soil amendment instead.